Set in 1987, a year after the UK government’s Big Bang deregulation of the City of London's financial institutions, John Barker's Futures (PM Press, 2014) follows the contrasting trajectories of several fictional protagonists operating in different but overlapping niches in the capital’s illegal drugs market. Events described from the main characters’ own perspectives occur in the weeks leading up to, and shortly after, the 15th-16th October hurricane, which temporarily scuppered everyone's mobility and communications, followed on the 19th by Black Monday's stock market crash. As with the meteorological and economic weather patterns, the novel’s coke-fuelled outcomes also fail to yield dividends corresponding to theory, planning and expectations, so that the results of various agendas and efforts come more or less spectacularly unstuck. But before the wheels come off, and as the tension ratchets up, we are given richly detailed accounts of the lives, attitudes and preoccupations of a diverse set of Londoners adapting to and coping with change and attempting to exert control over their fates. This was a period when the dust was settling after the first tranche of social and political upheavals induced by the policies of Thatcher's governments, which had already drastically damaged the present circumstances and fundamentally foreshortened life-chances for swathes of the population, but before the fallout had become integrated into the everyday culture of atomisation, consumerism, moral squalor and cynicism that we've become familiar with since. And because the vernaculars, idiosyncrasies and interactions of such disparate folk are rendered pitch-perfectly, the impression is given of a fully realised and comprehensive cross-sectional snapshot of social strata at the time which might mirror comparable situations in all sorts of other licit and illicit fields of endeavour. That this effect is accomplished with such a minimal fleshed-out body count, largely through sharp, believable dialogue and judicious employment of interior monologue in response to the demands of a compelling storyline, is testament to the author's command of narrative and characterisation. At the centre of the action is Gordon Murray, drugs wholesaler and London criminal born of the old school, who is resolutely and brutally traditional in his logistics, security and human resources practices while also keen to modernize money-making activities in line with his take on the new commercial environment. Thus profits are laundered by and siphoned into investments in property and yuppie service ventures in newly gentrifying districts, while sectors of the business such as heroin from Iran are divested if margins or risks are judged to be unsatisfactory, and eventually the decision is made to broaden the stock portfolio via one of the dodgy offshore brokerages flogging innovative deals and clamouring to cater for the excess capital swilling about in the wake of deregulation. Murray's partners in the family firm are his brothers Derek, a hard man and enforcer handling distribution operations, and Keith, a cautious accountant; whereas Gordon is the chief executive and strategist. This character was intended to be ‘totally unromanticised [...] nasty but boring’, but he is also rather pathetically aspirational, socially and intellectually as well as in terms of greed . This is shown, for example, in ‘the way he kind of mimics neoliberal language’, seeing himself as a discreetly model ‘captain of industry’ but who is ‘in the end, a bit of a panicker' . On several levels, then, Gordon's overbearing self-satisfaction justifies his pivotal role in the story, given the ramifications of his vainglory for the rest of the cast. Functioning as little more than his narrative appendage is a paid informant, Detective Chief Superintendent Graham Curtis of the Metropolitan Police Drugs Squad. Barker presumably enjoyed the portrayal of a creature even more pompous, self-righteous and venal than his clandestine employer: Curtis is obsessed with professional status and outmanoeuvring colleagues in a blatantly dysfunctional organisation. In their secret meetings, Murray barely tolerates this petty bureaucrat’s piety, snobbery and hypocrisy in order to cover himself and become apprised of specific foreknowledge about the Met’s legendary lack of bona fide ‘intelligence’ so as to plant misinformation and prompt strategically valuable legal travesties . Such relatively low-cost ‘outsourcing’ tactics are probably deemed expedient for the balance sheet, even if leaving the gangsters more short-staffed when going in mob-handed might otherwise be called for. Nonetheless, the prominence and space afforded to Curtis is mildly surprising given his tangential significance to the plot. Descriptions of sundry escapades orchestrated by him certainly reinforce the message that the state authorities charged with ‘regulating’ (i.e. shutting down) this particular market are at best a practical irrelevance – in contrast to PR claims concerning nominal aims and purposes – and, at worst, the crooks’ (unwitting) footsoldiers. Furthermore, the well-worn crime fiction tropes either lionising heroic crusading cops or demonising them with superhuman doses of evil or corruption are also effectively belied – showing that any truth in them tends towards banality – but this goal too could surely have been accomplished more economically . Completing the representative sample of narcotics tradespeople is Carol Curbishley, who receives supplies from the Murrays through a distributor called Terry, one of their longstanding middlemen. Aged 35 and from a working-class background, she is a small-time cocaine dealer and single mother of a 9 year-old daughter, living in a housing association flat but using a friend’s landline for telephone contact with clients. All of her self-designed security precautions are followed scrupulously but are also potentially flimsy, her preoccupied awareness of which causes great anxiety and paranoia and impacts negatively on her social life. However, despite regular ruminations on how to get out of the business altogether given the precarious unpredictability of income and prospects, alternatives remain elusive. Nevertheless, as the story unfolds, she finds herself in a situation which may promise an escape route along with financial security for the first time in her life, but without the wherewithal to realistically weigh up the odds. Barker says he feels ‘very sympathetic to her, representative of a very ordinary person who has to make this decision’, and it is symptomatic that, in the end, Carol turns out to be more pragmatically grounded than those with far broader knowledge and experience. In fact she is the single straightforwardly likeable major figure in the novel and the only one capable of genuine adult relationships, compared with the others who perceive people as objects for instrumental use or boosts to egos or narcissism. As a strong woman with generally sound ethics (even with this job), she is also a welcome counterpoint to the offhand misogyny of the movers and shakers, which unerringly unmasks feeble personalities behind purportedly superior intellects and loftier ranks. Of course, unbeknownst to Phil and Jack, those occupying other positions on the greasy pole they hope to ascend are doggedly pursuing their own bottom lines, which increasingly converge, commingle and conflict in what turns out to be a perfect storm of wrecked ambition – but with dissimilarly disastrous outcomes roughly consonant with the scale of misconceived hubris and delusions of grandeur. So the accelerating pace of the narrative finally yields a cascade of interlocking denouements where the protagonists go out with either a big bang or abject whimper or, if they're less unfortunate, live to fight another day. The latter seems to be the case for Supt. Curtis, whose assiduous pursuit of Murray’s misdirections seems for a while to enhance his stock but then leads to exposure of his wrongdoings to an equally compromised colleague also battling the tide of high-flying graduates fast-tracked into upper echelons of the Met to effect its renovation (i.e. polish the PR and weed out the most embarrassingly unredeemable dinosaurs). Meanwhile, having sensed the way the wind is blowing and unwilling to venture further out of her depth, Carol kicks her dilemma upstairs to Terry and escapes the apocalypse by the skin of the teeth – complete with new lover and stepdad to the kid, though now bereft of a livelihood and, we fear, her worryingly incommunicado best friend. Things are decisively terminal, however, only for those at, and aspiring to reach, the top of the pile. Blinded by quaint trust in the ability of the dismal science to accurately capture the often barbaric reality of major league narcotics, Phil and Jack ironically assume that access to a bigger shot than ‘Simone’ heralds the impending realisation of their dream. Instead they fall prey to Gordon’s maniacal last-ditch scheme to rescue some readies from the collapse of his empire, leaving one dead and the other framed for his pal’s murder. Murray himself, meanwhile, utterly misjudges the elite sphere of high finance and global cosmopolitanism he felt entitled to enlist in and is comprehensively swindled by the new investment advisor he assumed was forging his passport for entry. Further, and with more immediately and literally fatal import, he has completely lost touch with the grassroots end of the business and succumbs to the unexpectedly (to him) vicious, disrespectful and destructive atmosphere that prevails on the streets with the progressive degradation of working class communities: something brought on by the very government policies he has hitherto benefited so handsomely from. Thus, in one way or another, all of the book's main characters are defeated by the sheer multifaceted complexity and pace of the changes taking place in their worlds, with the nature and gravity of each prognosis depending to a large extent on that individual's levels of blithe ignorance, vanity, avarice, and humility. Much of John Barker's background material for the book was gleaned during spells of imprisonment, first between 1972-78 after conviction as a member of UK urban guerrilla outfit the Angry Brigade, and subsequently when sentenced to five years in 1990 for involvement in an international conspiracy to import cannabis . Thus his profile of the London drugs scene and treatment of its denizens and their conduct, idiom and worldviews can be assumed to be based on extensive inside knowledge (in both senses). Likewise, the exhaustive details of Phil and Jack’s professional activities and their musings and prognostications on the state of the global economy from within the belly of the beast were partly sourced from studious critical attention to the broadsheet financial press while incarcerated, adding further flavour to the notion of jail as an academy of crime. 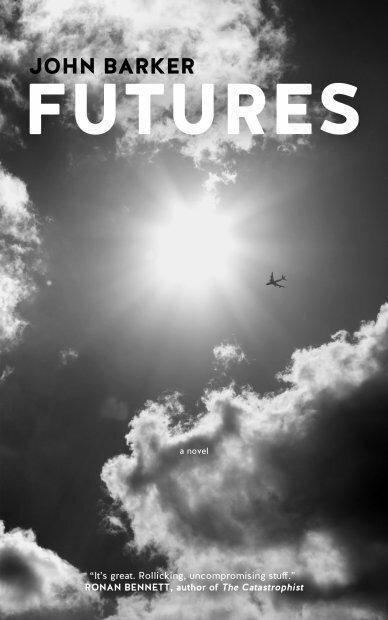 It’s worth noting, therefore, that Futures was originally drafted two decades ago, and its much-delayed publication (with the help of a Kickstarter campaign) should not detract from an appreciation of its acuity concerning both the prevailing structural adjustments in criminal and other enterprise and the fantasies of omniscience associated with faith in ‘rational’ or ‘transparent’ markets (or marketers), as well as prescience concerning the catastrophic consequences of such beliefs irrespective of the sector concerned – which most allegedly expert commentators took rather longer to cotton on to, if at all, even with the advantage of hindsight. Nevertheless, the author is at pains to emphasise that this is just ‘a kind of crime story – in no way a political tract’. But then, crime fiction has always interrogated the contours of power through accounts of activities judged to be taboo and how their manifestations are to be legitimately handled, so a crime story can scarcely avoid being political at least with a small ‘p’. In British literature this often entails reactionary rationales for restoring equilibrium to an inequitable status quo or favouring fascistic purging of criminal perversions from the social body. Meanwhile an alternative tradition originated in hard-boiled stories of American private dicks negotiating the shifting sands of class structure and the failure of mainstream institutions to acknowledge or provide redress for injuries caused to otherwise helpless citizens cut adrift from traditional family, community or solidaristic mechanisms. This inherently critical and potentially radical literary lineage has blended over time with gritty tales of colourful rogues getting one over on their social superiors, gangster sagas, conspiracy thrillers, and downbeat social-realist scenarios of impoverishment and brutalisation in lower-class milieux. These flourishing genres and sub-genres have more recently increasingly attracted more ambitious writers and filmmakers keen to diagnose wider social and political problems by dissecting large-scale patterns of wrongdoing and their reflections and reverberations throughout society. Intentionally or not, this novel definitely fits such criteria . Two of its narrative strategies in particular help to differentiate Futures from more restricted or run-of-the-mill fictional depictions of organised illegal activity and attempts to control it – and especially those involving banned drugs, which typically arouse ire, indignation and distortion out of all proportion to the harm caused (compared with, say, nicotine and alcohol) and relative to other types of serious crime. Firstly, as mentioned previously, the cast selection distils down an extensive hierarchy of punters, dealers, middlemen, gangsters, hangers-on, competitors and adversaries into a very limited set of characters, which allows all of their social environments, work situations and internal lives and behaviour to be thoroughly and equitably elaborated. Moreover, no specific viewpoint is privileged in terms of any overriding attribution of responsibility or moral judgement; nor does the degree of emotional or cognitive depth ascribed to some characters contrast with others sketched more abstractly or stereotypically. In the absence of such clichéd rhetorical tactics – which facilitate the assumption of ideologically loaded preconceptions or identifications that tend to yield an unbalanced and partial grasp of the world described – the reader can more readily concentrate on the intricacies and machinations of the plot, taking into account, in turn and in combination, the characters’ contrasting perspectives on and responses to events. Secondly, the novel’s episodic construction provides details of each successive short period of time from one character’s viewpoint only, so that the significance or effects of actions taken are left to the reader to infer from retrospective and/or indirect references in subsequent intervals according to different perspectives. This is a brave strategy, since readers may be left floundering to connect the dots and keep up. However, it also intensifies awareness that the protagonists may be aware only dimly or not at all of what the others are doing, missing the origins of minor or substantive changes affecting their own positions or the consequences of their own behaviour and that of others. A major dividend is that this leads to a mirroring between the reader’s efforts in following the twists and turns of the tale and the difficulties encountered by the characters themselves in interpreting their own experience and formulating their plans accordingly. In both cases, the inherent risks, uncertainties and pure unknowns in life are foregrounded, along with the wisdom of taking into account the material inertia of existing bodies and relations and the barriers introduced to the possibility of their and our comparative autonomy. Just as parallels can be drawn between the range of functions that these characters serve in their world with those operating in many more conventional and less dangerous and stigmatised realms, so the portrayal of the frustrations, impasses, ignorances and breakthroughs of those dealing in drugs hints at continuity with, rather than alienated distinction from, the ‘normal’ life of society – where similar general constellations of forces constrain action. Given these rare and impressive qualities, it might even be proposed that a film adaptation of the novel would enthral a far larger audience – if a courageous and competent enough production team were tempted to take on the task who could do as much justice to its subtle and sophisticated subtexts as the obvious entertainment potential. A television serial would appear most suitable for a story of this weight and complexity, and although the track record of UK media fictionalising the controversial field of the drugs trade is sparse, there are promising precedents. Traffik (by Simon Moore, Channel 4, 1989) at least attempted a multi-stranded structure melding local, national and global elements of the heroin trade, but with a relentless focus on and clear sympathy for its upper middle-class characters. Much later (and skipping the bilious nihilism sugar-coated with New Labour aspiration of Danny Boyle's 1996 Trainspotting), following the acclaim afforded to the British feature film Bullet Boy[/] (directed by Saul Dibb, 2004) which tackled a Hackney family’s struggles with petty crime and gun violence, Channel 4 commissioned two series of the excellent [i]Top Boy (by Ronan Bennett, 2011/13), a similarly exemplary and unusual social realist story of the trials and tribulations of a small East London manor’s low-level drugs posse which also refused to diminish, homogenise or demonise its miscreants. Likewise, the feature Twenty8k (directed by David Kew & Neil Thompson; written by Paul Abbott and Jimmy Dowdall, 2012) made a decent fist of expanding the drugs game palette to include dodgy finance, land grabs, property speculation and municipal corruption in the run-up to the London Olympics graft-fest. Of course, the two ultimate benchmarks for filmic fantasies of the relationship between the narcotics industry and society as a whole are American. Yet, with its uniquely detailed characterisation and effortlessly effective weaving of narrative threads, one could imagine that a faithful visualisation of John Barker’s novel might compare favourably in quality and breadth of sweep with the achievements of the renowned US television series The Wire (by David Simon & Ed Burns, HBO, 2002-8) and Breaking Bad (by Vince Gilligan, AMC, 2008-13). Both chronicle careers and contexts associated with neurochemical scourges rather nastier than the upmarket appeal of powdered cocaine, blighting lower-class neighbourhoods with the crack derivative in urban Baltimore, Maryland, in the former, and an epidemic of crystal methamphetamine in the suburban US southwest in the latter. However, the political visions animating these epics are rather tamer and more conformist than their bold premises might suggest. So The Wire's magisterial cycle, tracing the interconnected complicity between drugs commerce and spheres as discrete as policing, unions, logistics, education, city politics and journalism, consistently homes in on enlightened reform-minded managers whose hearts are supposedly in the right place – hazily insinuating that some such social-democratic vanguard might mend the broken society. Meanwhile, the very different alchemy of Breaking Bad transmutes the resentment of the ‘squeezed’ middle-classes – once illusions of social progress and mobility through respectably professional hard work are exposed as busted flushes – into an obscene subaltern reflection of the cynical barbarism of government by raw capitalism itself. Equally three-dimensional in nailing its setting, and convincingly true to its time, Futures trumps them both in certain respects: even-handedly rendering the agency available and prominence given to those on vastly different rungs of the dealership ladder; withholding an omniscient overview to which all of its fallible embodied subjects are, or should be, philosophically subordinated; and, most notably, being persuasively suggestive of things to come. It can then be read as a minimalist allegory of general features of neoliberalism, which could also be projected into the forthcoming years after the first flushes of Thatcherism – and with an underlying political sensibility which is precisely a critique, rather than denial, disavowal or displacement, of the ideology now often described as ‘capitalist realism’ – i.e. that ‘there is no alternative’. So, if the novel's cast are imagined as prototypes and precursors of later incarnations, the metaphor would encompass the Murray firm’s latter-day retail concern cutting costs and corners to dominate the high street, for whom Carol works as subcontracted precarious labour (herself delegating communications duties to Marie) while Terry has slightly more secure and rewarding tenure. Meanwhile Gordon stands for the company’s top management, mercilessly fleecing the accounts under the noses of colleagues and shareholders in order to feather his own nest irrespective of more distant prospects – with Phil and Jack as early avatars of the new generations of up-and-coming accountancy whizzkids from investment banks prescribing cooked books and mendacious valuation to conjure obscene profits today at the expense of stability next week. Finally, Curtis et al of the Met represent tarnished government checks-and-balances painfully transitioning from the archaic blunt institutional monopoly of force to New Public Management fetishes for performance targets, pop psychology, flexible human resources and spin – promising not less ineptitude, hypocrisy and malevolence in the service of money and power, but more mystified varieties of the same ... Not going to end well, is it? So, in the unlikely event of something like the pitch pencilled in above reaching fruition, its advertising copywriters could probably do worse than the publicity tagline: ‘Did charlie cause the credit crunch?’ In fact, this question – in equal measures playful, rhetorical, and deadly serious – haunts the novel and the author’s Afterword as well as the appended text on the political economy of coke. The straightforward answer, naturally, is ‘No’, as Barker himself acknowledges in his commentaries. However, merely taking it at face value opens up the issue of the origins of the fantasies of economics omnipotence that have helped fuel an escalating series of local and international financial burst-bubbles, crises and crashes which have accompanied neoliberalism’s worldwide sway. Doubtless no less salient and rooted in a rather wider history are long-term declining rates of return from real-world productive investment, leaving the trillions trickling up to the elite stratosphere from structural adjustment – including in the consolidation, intensification and rationalisation of narco-production and distribution – nowhere else to profitably go except towards even more of the same toxic medicine. Nevertheless, could the brains behind the new miracle mathematical nostrums of derivatives, algorithms, and supercomputer simulations have been on a decades-long collective coke binge, along with their counterparts in the other burgeoning high-end ‘creative industries’ feverishly fashioning fictitious cultural and social capital in their respective realms? Well, it's intelligible that the behavioural characteristics of cocaine use – wild short-term enthusiasm, single-minded blind persistence, manically inflated confidence and other bipolar patterns – could influence specific, more or less superficial, features of developments . But even if so, how is it possible that the great and good who own and govern the globe would go along with it? In summary, then, the achievement of Futures is that it can be enjoyed as a simple, and extremely effective, crime yarn – but can also easily prompt such extensive speculation. This is surely no mean feat. 1. A point repeatedly made by Barker in readings and interviews accompanying the launch of the book. The same applies to other quotes from the author within this review. 3. One such incident involves fitting up a rival crime boss, who is in any case plainly guilty of many serious offences (if not this one) – perhaps a sly reference to the author’s own experience as an Angry Brigade defendant, where ‘the police framed a guilty man’ (John Barker, review of Anarchy in the UK: The Angry Brigade by Tom Vague, AK Press, 2001, available at: http://www.katesharpleylibrary.net/4b8h98). 4. Though maybe it’s churlish to expect the writer to forego gratification in trashing a figure who, in a conventional tale, would represent the master criminal's sworn enemy – especially in this case where the first-person voice granted only to Gordon may already imply a degree of over-identification. 7. See the section entitled ‘Biotool’ in ‘From Coca to Capital: Free Trade Cocaine’, ibid. Review first published by Mute, http://www.metamute.org/editorial/articles/chronicle-crash-foretold. For other reviews and essays by Tom Jennings, see: Freedom magazine, 2003-2013; Variant[i] magazine (http://www.variant.org.uk); and http://www.tomjennings.pwp.blueyonder.co.uk. A new collection of John Barker's short stories: "Criminal Justice Acts" is available as an ebook. http://www.theharrier.net/product/criminal-justice-acts/. Like Futures, a mix of memorable characters and disturbing situations.